TO the premiere of Gnomeo and Julie (it is as it sounds – gnome meets lover; gnome losers lover; gnome impales himself on fishing rod barb). The film is produced by news dads Elton John and David Furnish, they of the censored sperm shake. This might well be the future for Elton. New celebrity mums and dads are fond of turning their soft hands to the creative arts and bringing us ranges of clothing and books so that we plebs can dress our sprogs like better looking and more talented babies. We can read our kidzzz the same stories, perhaps while impersonating the famous writer and thus increase the chance, however miniscule, that our child will not grow up to resent our inability to get them record deal and a modelling contract with Chanel. PS – look ut for Alex James’s teeth which seem to be made of his beloved cheese, and Boy George doing a Benny Hill. 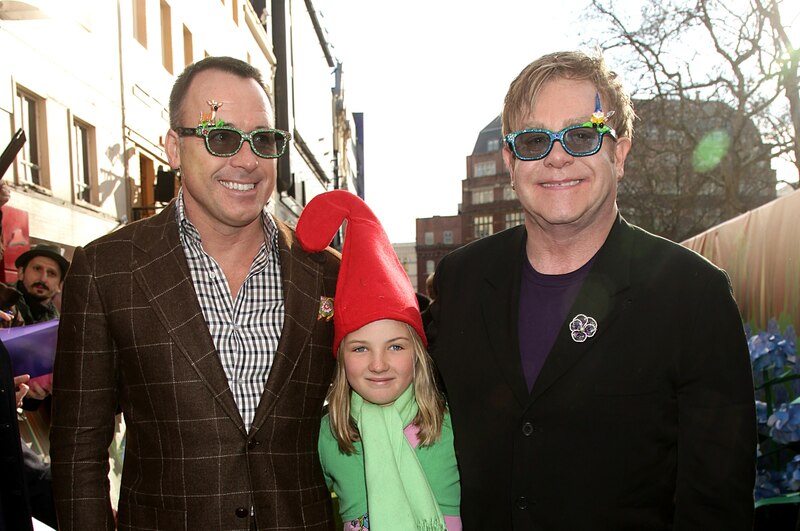 Sir Elton John and David Furnish with David's goddaughter Esme, arriving for the premiere of Gnomeo and Juliet at the Odeon Leicester Square, London.